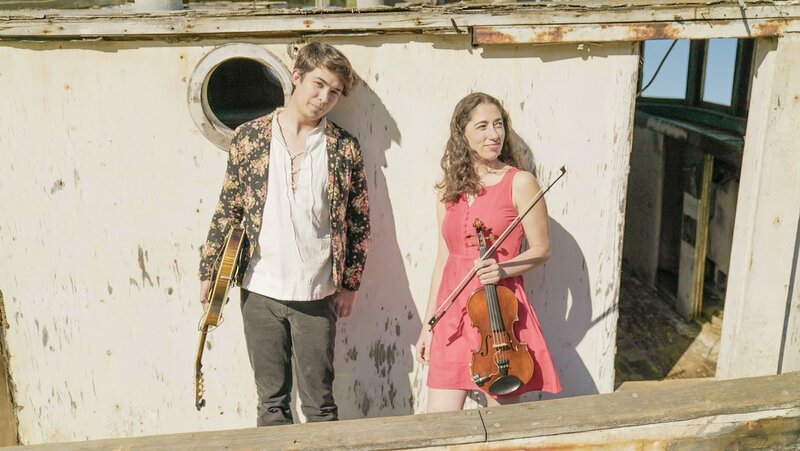 Award-winning instrumentalists and composers Tristan Scroggins and Alisa Rose have created an album that explores both the dynamic capabilities of a string duet and the creative overlap between baroque and bluegrass improvisation. With vast experience and knowledge of both traditional folk music and classical styles they create new music that utilizes risky improvisation and innovative musical techniques that are captured in both the original and familiar tunes present on this recording. Their effort present a study of both active listening and performance skills as the listener is invited into and pulled to each others spur of the moment musical colors and ideas to create a ever changing exciting performance. Listeners will be rewarded with missed details after every following listening as this record adds to the ever growing lexicon of new acoustic music. ​Tristan Scroggins, tristanscroggins.com, is a mandolinist and composer from Denver, Colorado and the recipient of the 2017 Momentum Award from the International Bluegrass Music Association for Instrumentalist of the Year. Tristan has toured extensively in the US, Canada and Ireland for the last six years with the critically acclaimed bluegrass band Jeff Scroggins and Colorado. At 22 he already has a decade of professional experience as a stage performer, instructor and recording artist. Tristan is also an alumni of the Acoustic Music Seminar run by Mike Marshall as part of the Savannah Music Festival. Son of two time national banjo champion, Jeff Scroggins, Tristan originally gained notoriety as a young phenom winning multiple state championships before the age of 16. Around then Jeff and Tristan got together with five time Society for the Preservation of Bluegrass Music in America Guitar Player of the Year, Greg Blake, to form Jeff Scroggins and Colorado. While working with Jeff Scroggins and Colorado, Tristan has been a featured artist at the International Bluegrass Music Association's Wide Open Bluegrass Festival, The European World of Bluegrass Festival, Merlefest, Rockygrass, the Father's Day Festival in Grass Valley, RTE Ireland's National Radio, and the Station Inn in Nashville. In addition to performing Tristan has taught mandolin at several workshops and camps including Nimble Fingers in British Columbia, Northern Lights in Saskatchewan, NCBMS Camp in Alberta, and Wintergrass in Washington. Tristan has one studio recording of all original tunes, one of which was a finalist for the International Acoustic Music Awards Instrumental Song of the Year. Tristan has also had the privilege of working with and being featured on recordings with Grammy winning producer Bil Vorndick, Sally Van Meter, Tim O'Brien, Darrell Scott, Mark Schatz, K.C. Groves, Andy Leftwich, Don Rigsby, David Peterson, and Jono Manson. Fiddler and violinist, composer and improviser, Alisa Rose, www.arosefiddle.com is a modern musician who easily navigates between many musical styles. With roots in classical music as well as the rich American musical tradition, she attracts attention for her expressive lyrical voice on the violin. Alisa Rose has performed with a wide range of artists including the Real Vocal String Quartet, 2008 Rockygrass winners 49 Special, and Grammy-nominated Quartet San Francisco. Alisa performed and taught throughout Eastern Europe as an Ambassador of the State Department, and has performed at Carnegie Hall, NPR's Weekend Edition, the historic Carter Family Fold festival, TEDx Alcatraz with Bob Weir, Song of the Mountains on PBS, as well as numerous international tours. In 2015 Alisa premiered Richard Marriott's "Metropolis Concerto for Violin and Wind Orchestra" with the Dartmouth Wind Ensemble, and in 2016 premiered her own "Piano Trio for Luisa" as part of the Trinity Arts Chamber Music Festival. As a member of the Real Vocal String Quartet she appeared on the Feist album Metals, and in 2015 released an album of her cross-genre virtuoso works for solo violin entitled Fiddle Caprices and Pizzicato Pieces. Alisa teaches privately as well as in the pre-college division of the San Francisco Conservatory of Music, where she received her B.M. and M.M. in Chamber Music studying with Camilla Wicks and Bettina Mussumeli.